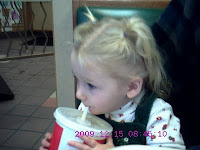 This is a picture of my youngest grandchild that I don't think I've shared before. She turned 2 in December. She was a preemie and is still so tiny it's highly unlikely she'll ever need any best weight loss supplements. In other news me and Mr. Skittles went to our eye appointments yesterday. (Yep. Skittles left the building house.) As expected I need new glasses. Trifocals. TRIFOCALS. Sheesh. He said it's normal for someone my age. Sheesh again. We found out the insurance coverage has changed. We never had to pay a copay at all before. This time everything was half. Half for the exam. Half for the frames. Half for the lens. Better than no insurance to be sure.. but between the two of us the bill came to over $500. OUCH says our bank account. Hmm never heard of Trifocals before! What's next? Quadruplefocals? And then what? Good for you for leaving the building. Yeah - major ouch! Health insurance is so dang frustrating!!! Your granddaughter is absolutely adorable! Beautiful granddaughter. I am the granny of 4 and they have made my life even better. It's fun to watch them grow and learn. Copays changed on my insurance, too! And I NEED to see the eye dr. I had Lasik 8 years ago, but my vision has gotten bad over the last few months!